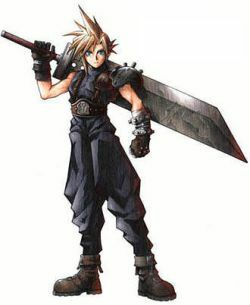 Cloud Strife's appearance is marked by spiky blonde hair, vivid blue eyes with a glow (a mark of SOLDIER and a sign of having been exposed to mako), dark purple or blue clothing, and his Buster Sword (a zweihänder-style sword with a distinctive, oversized blade). The Buster Sword more closely resembles a Full Blade sword. He possesses a combination of Thanatos drive and avoidant personality disorder. During the first part of the game, Cloud states that he is a former member of the corporate regime Shin-Ra's private elite military known as "SOLDIER," and exhibits immense skill and combat prowess that supports his claim. Hired as a mercenary for the Shin-Ra resistance movement known as "AVALANCHE," Cloud fights alongside Barret Wallace, his childhood friend Tifa Lockhart, and an ill-fated trio of AVALANCHE members: a passionate woman named "Jessie", a cool-headed man named "Biggs" and a rotund and friendly engineer named "Wedge." Participating in various covert missions, Cloud is extremely aloof and unsociable to the others, putting forth a cold, all-business exterior. At first, Cloud will open up somewhat only to Tifa. Shortly after the game's first mission, however, Cloud meets a young flower girl named Aerith Gainsborough, a woman who will have a profound impact on Cloud's life. Dodging the Shin-Ra's military, Cloud eventually finds himself protecting Aerith from Shin-Ra and their covert team known as "the Turks," who wish to capture Aerith for reasons yet unknown. Joined by Tifa shortly thereafter, the trio have a short misadventure in the slums of Midgar involving Cloud humorously having to cross dress as a woman—a first glimpse of Cloud's lighter side and the first major comic relief of the game. As the story unfolds, the Shin-Ra corporation destroys part of its own capital, Midgar, in an attempt to crush AVALANCHE. Countless are left dead, including three members of AVALANCHE, and Aerith is kidnapped by the Turks' leader, Tseng. It is revealed that the reason Shin-Ra has wanted Aerith apprehended is that she is the last remaining member of an ancient race known as "the Cetra," who are said to have mysterious powers related to the Planet. With few other options, Cloud is accompanied by Tifa and Barret in infiltrating the Shin-Ra headquarters to rescue Aerith and put an end to their terror once and for all. Upon rescuing her and finding a non-human, but very intelligent companion called "Red XIII," Cloud and the others are shocked to find the President of Shin-Ra dead with a long sword in his back. Cloud instantly recognizes the sword as belonging to the legendary SOLDIER member, Sephiroth. Shin-Ra is then taken over by the deceased president's young and ruthless son, Rufus Shinra, and the group makes a daring escape from Midgar to start a journey that will span the entire world and draw Cloud and his companions into something far bigger than anyone had ever imagined.